Writing a farewell email sets the power of revising everything about the co-worker like the tenure, the memories, the projects accomplished and of course the departure. It is all about taking the best face forward towards the company and the other employees of the company. First of all, make sure when you are going to send the email. Exactly at the same day of departure or few days before the departure. 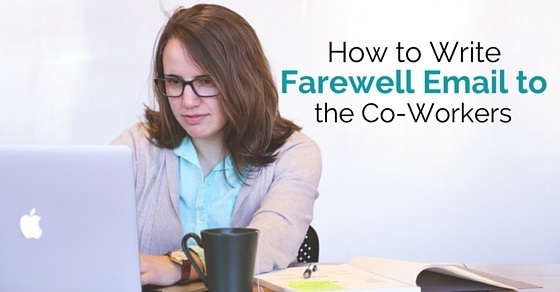 The matter inside the goodbye email to coworkers will depend on the time and date when the colleague is leaving. If the person is leaving a few days before, then it ought to be professional enough with a personal adieu in it. If the time is enough to say goodbye, then you might want to chat with them, so you are free to add some interesting lines so as to reduce the emotional environment of the office. Whosoever you are going to send the email, prepare the email in such manner, like if it is going to colleagues inbox, then you can be little informal but when it comes to the boss or the whole management team, make it formal. Make the email personal by mentioning the names of the individual you are addressing to. Not just this, also go and meet the co-worker in person and bid adieu with beautiful farewell words so as to make the farewell memorable enough. Making personal also means to add some of the stories you together went through. You can also add some humor to the email, making the scene less emotional and more happy. Do not make a farewell email lie a regular mass internal email, rather make it an art form. You can also add pictures and videos to make it more absorbing and fascinating. It should be more like a treat expressing the bittersweet emotions of leaving the office. The subject line of the email should be ominous yet playful. The farewell message for colleagues should be little less alarming as you know the boss already has announced the farewell to the whole staff. Do not write anything negative like ‘this is it’, ‘the unfortunate departure rather’ go for something like a fond farewell, happy goodbye and so on. If you will make the subject line little threatening, everyone would like to open the email and they will be happy in doing the goodbye ceremony. Hence a surprise element in it. The time you chit chatted with the colleague, the group work, the important projects and the teamwork you all did should also be penned down. This will make everyone remind of the good old days and will also make the colleague feel happy for receiving such a sweet farewell. Not just the work that you did together should be mentioned, but also the trips you made, the photos you clicked can also be added in the goodbye email to colleagues for a memory. Write everything in a tone as if you are feeling sad, because a great person is leaving the company after serving for too long. In the work farewell email to coworkers, talk about the exciting next chapter of the person. Give the blessings, the goodbye wishes that you may prosper ahead in life or say something like, explore the bleeding edge of the technology, follow the passion, etc. Writing lengthy notes will never be an issue, so it is a goodbye message not the termination letter that leaves you wide eyed. Mentioning the tenure you worked in the company gives a flash back memories to the colleagues and will leave him or her emotional for a second. Write in a thankful manner like, thank you for your great contributions towards the company for near about four to five or whatever the years a person served in the company. Write in a polite, yet playful manner. The happy tears in the eyes will make the day ever memorable for the employee. Begin the letter by saying how difficult was the decision to say goodbye to the person whom with you enjoyed a lot and made a number of unforgettable memories. Just oblige the person and say thank you for providing life long never fading memories, good experiences, the delible teachings and for everything else. Do not make the goodbye mail to colleagues boring or you will fail to reach the whole staff. The employees in the company are not free to give a look at the wasteful emails and maybe the email you send to the whole staff is meant the same(waste and boring) to all, just because of the boring content. So, do not write anything which bores the employees. Write interesting moments in it with little of humor. Every group has one or the other person who makes fun and adds fun and frolic, so write about that person too, and it will make the email, a goodbye note worth reading. Think of all the notable contributions made by him in the company. Mention the team projects, the accomplishments he had, the appraises he or she received from the top management. Write everything from a pin to an elephant about the person, but all should be in a positive manner. End the note with some good and sage advice. The advice can be anything like a quote from any book, or the quote of any scholar. Basically the advice to the person must be motivating and be in such a manner that the person does not feel sad. Your advice should not leave the atmosphere gloomy instead it should make everyone smile with the end note. Also, you can add humor at the end. If the person was close enough to the heart, you can be informal saying something friendly to him or her. You have to write a work farewell email to colleagues in a brief and attractive manner. Do not write lengthy sentences. Just write in brief as you know the employees are busy with their office chores that they may not have enough time to read long essays. Just write in a professional and crisp manner, giving everything but in brief. While you write an last working day email, make sure you give your contact number and the address so as to strengthen the network. This way you are inviting the co-workers to remain in the contact for long and also it is a way of extending a help to the employees if they need any sort of help for the future. You have to write a goodbye letter so, be thankful to the person, be polite, and do not pass any judgement related to any project that went incomplete or was unsuccessful. Bring forward the positives and shed off the negatives. Focus on the things that made his as well as your journey memorable. Do not ask the direct questions and be straightforward in writing the salutation, the respect and bring the thanking attitude to the forefront. Make sure the farewell to colleague does not turn to be your gloomiest day, not for saying goodbye, but for violating the norms of the office. Keep in mind the considerations and also be comfortable in writing what you want to write. Violating norms and rules of the office will only make you feel bad and you may even be in trouble for it. So, be in the limits assigned to you, and enjoy the farewell with others. You do not have to be philosophical towards life. Just be professional, say thank you, bid goodbye to coworker and wish for the luck to go best for him or her. That’s enough to say goodbye to a coworker who served the company with you till date. You might be a very close friend to the employee leaving the company, but mind it, not to mention any of the reasons which hurt the sentiments of the higher staff like hating the job, the manager’s attitude, or of the co-workers. You know if you are writing a work farewell email, you are all the reason for either bringing smiles or forming tears in the eyes of the whole staff. So, it is better to be the reason to smile and not sadness. Write in such a manner that it excites everyone and the blessings flow from everyone’s mouth, even from the non interesting one’s. The main rule for writing down the work farewell email is being professional. Either write directly or indirectly, whatever way, but it must be professionally written. Do not be inflammatory in expressing the views towards the person. This is your duty to ponder over that what the person receiving farewell will think of you while reading the email. It should be good and kind for you after reading the mail. It is in your hands to stop the person from whispering foul words for you after reading the email, in case you had some triffles or bad times with the respective employee. So, be kind in writing even if you have never been on smooth terms with the co-worker. If you have a personal and professional profile on LinkedIn, then send some farewell letters through them. It will help you out in bringing closeness among the employees and also will nourish the ties between colleagues leaving the organization. It is always good to stay in contact with people who are leaving as it creates life long bonding with them. LinkedIn is the professional way of strengthening bonds, expanding the professional circle and also making others feel your presence in the competitive market. Your excitement and hatred for the job should not be presented to anyone. Although you are on cloud nine, yet do not let your excitement turn into a doubt for everyone. Be a little secretive, show that you are sad, yes, it could be true as well and if it is, sadness, will be presented on its own in your writing. Not showing the excitement is only to prevent resentment. Just mention what next you are going to do and where you are going to join, for inspiring jealousy, indeed, everyone does, what if even you do it a little? So, follow above points while you write a work farewell email to colleagues. While writing, make sure you sum up by explaining the awesome time spent, the experience you got, perfect team spirit and also the contacts, networking you build all throughout. Everyone has to face it, whether he is a boss, an employee, manager or even the friends. Better deals will come through and you will have to choose the best for yourself. One day your inbox will be filled with the goodbye notices and the good wishes, so that will be the time when you will have to decide what and how will be your final goodbye to the company.